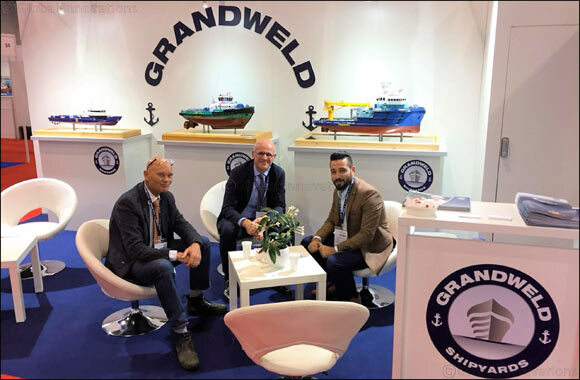 Dubai, UAE, 30 June 2018: Grandweld, the pioneering UAE-based shipyard, is participating in the International Tug, Salvage & OSV Convention and Exhibition (ITS), which is currently held in Marseille, Frane until 29th of June 2018. Grandweld is showing its manufacturing capabilities, while focusing on its outstanding strengths in tug, salvage and offshore service boat repair and maintenance. ITS 2018 is an exceptional event as it marks the 50th anniversary of the largest convention and exhibition of its kind in the world, which attracts top-level executives and decision makers from around the globe. Grandweld is participating in ITS to highlight the outstanding capabilities of the shipbuilding industry in the UAE. Abki commended the new decisions announced by the Cabinet to stimulate the investment and industry sector in the UAE. These decisions coincided with launching the ‘Ala'azm (Determination) Strategy’, establishing the Saudi-Emirati Coordination Council, and the ambitious economic projects that accompany this major achievement. The new initiative focuses on supporting the oil, gas, and offshore field sectors, which will attract many tugboats and offshore service ships to the region. This in turn, will support the shipbuilding and ship maintenance sector. 'Our participation at ITS 2018 is a remarkable opportunity for us to inform the global shipping industry about the ‘Ala'azm Strategy’ and the exceptional business opportunities that it provides to investors. The new initiative further leads the UAE to become the ideal gateway and the preferred maritime hub worldwide,' concluded Abki. Grandweld Shipyards has the largest covered shipbuilding yard in the region, spreading over 13,500 square meters at its headquarters in Dubai Maritime City. It also has 30,000 square meters for shipbuilding and maintenance in Al Jaddaf in Dubai. Grandweld employs over 800 professional engineers and technicians in shipbuilding and maintenance. To date, Grandweld has proudly added the 'Made in the UAE' mark on over 130 boats and marine vessels of all sizes and types.